What is Spring Constant and How is the Formula Calculated? Springs are elastic mechanical objects which, after they are deformed, that is, after being stretched or compressed, they return to their original shape. They are a necessary component for a wide variety of mechanical devices. From engines, appliances, tools, vehicles, and medical instruments—down to simple ball-point pens, the familiar metal coil has become an indispensable component in the modern world. The spring’s wide use and application is due to its ability to store mechanical energy. Its spring force is reactive, which generates mechanical energy – How much energy is represented by the spring constant. Spring force is the force required or exerted to compress or stretch a spring upon any object that is attached to it. When an object applies a force to a spring, then the spring applies an equal and opposite force to the object. It always acts so as to restore mass back toward its equilibrium position. Spring constant is a characteristic of a spring which measures the ratio of the force affecting the spring to the displacement caused by it. In other words, it describes how stiff a spring is and how much it will stretch or compress. Springs with larger spring constants will have smaller displacements than springs with lesser spring constants for the same mass added. 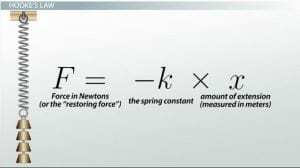 The spring force formula is expressed through the equation: F = – kx. 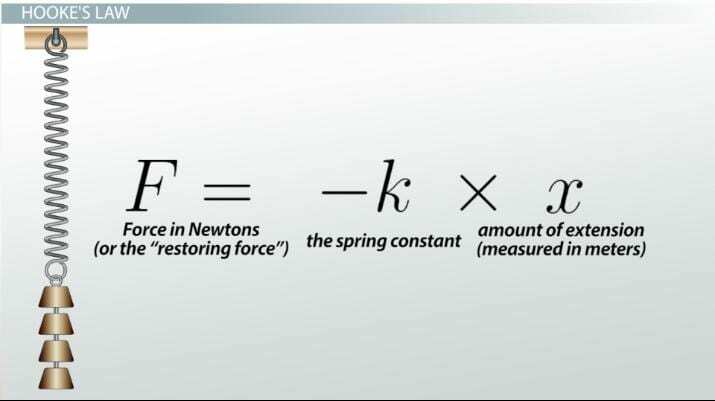 Where F is the force applied, k is the spring constant and measures how stiff and strong the spring is proportionally, and x is the distance the spring is stretched or compressed away from its equilibrium or rest position usually in Newton per meter (N/m). The minus sign shows that this force is in the opposite direction of the force that’s stretching or compressing the spring. The spring constant is the force needed to stretch or compress a spring, divided by the distance that the spring gets longer or shorter. It’s used to determine stability or instability in a spring, and therefore the system it’s intended for. As a formula, it reworks Hooke’s Law, and is expressed through the equation: k = – F/x. Where k is the spring constant, F is the force applied over x, and x is the displacement by the spring expressed in N/m. Hooke’s law describes the linear elastic deformation of materials only in the range in which the force and displacement are proportional. A spring’s elasticity will return to its original form once the outside force, whatever the mass, is removed. The spring constant is a property of the spring itself that shows the linear relationship between the force and the displacement. The amount of mechanical energy stored and used by a spring then, is relative to the force and displacement—the harder a spring is pulled, the harder it pulls back.